In an attempt to reduce the amount of meat that I eat, I started making quinoa salads more regularly since quinoa is high in nutrients and an excellent plant-based source of protein. I have compared quinoa purchased from Bulk Barn to Bob’s Red Mill organic quinoa. I found that Bob’s Red Mill organic quinoa held its shape more firmly, had a better texture, and tasted better (even though both sources of quinoa are basically flavourless). So in my opinion, it is worth it to pay [much] more for the brand name product. 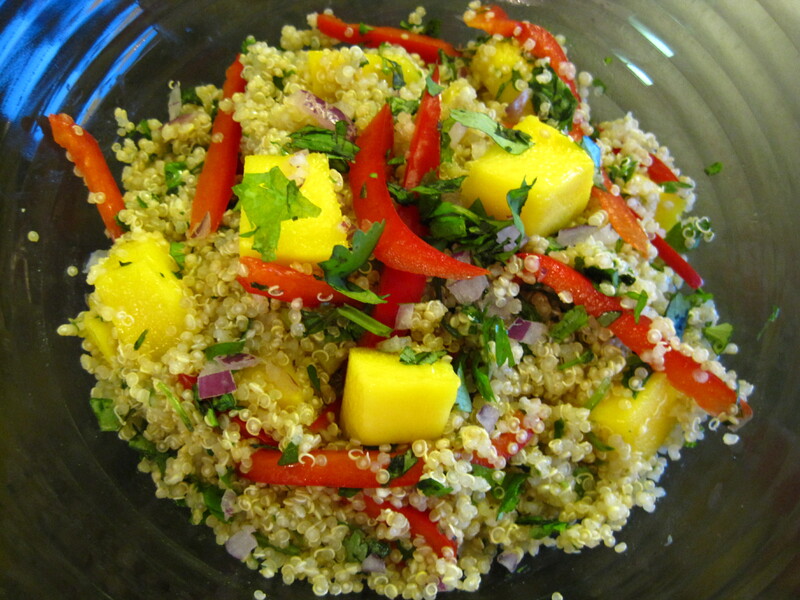 This variation of quinoa salad was inspired by mango ceviche (recipe here). See my other quinoa salad recipes here and here. In a heavy bottomed, medium sized pot (I use a ceramic dutch oven), bring 2 cups of water to boil over high heat. Then add the quinoa. When the water returns to a rolling boil, cover the pot with its lid and reduce the heat to maintain a strong simmer, at medium or medium-low. Cook covered until all of the water has been absorbed, about 10 to 12 minutes. Then add the garlic, remove the pot from heat, and fluff up the quinoa with a fork. Cover the pot and let stand for 15 minutes. In a large bowl, toss together the quinoa, extra virgin olive oil, lime zest, lime juice, red onions, cilantro, and red chili flakes until well combined. Then add coarse salt to taste and mix again. Add the red pepper and mango and mix everything gently. Store in the refrigerator. Serve cold or at room temperature. Hey Alison, I made this tonight. But I couldn’t buy the Bob’s Red Mill organic quinoa. I went with a cheaper brand. The market said it’s too expensive to buy for the store. You weren’t kidding about the [much] more. I love mango and quinoa, so I had to try it. thanks for the recipe. Hey Brad, I’m so glad that you used the recipe! I hope you liked it! Thanks so much for posting a comment 🙂 I hope I get to try your cooking one day soon!